Retire to the country! ... This ground floor two bedroom apartment for over 55's is in a purpose built two storey development in School Road within a level walk of all facilities including shops, pub, church, chemist, dentist and hairdresser (to mention a few!). Double glazing, communal facilities, gardens and parking. VACANT POSSESSION - NO CHAIN. EPC rating C. DIRECTIONS Built in the late 1980's, The Lodge is a delightful two storey development of one and two bedroom apartments specifically designed for the over 55's, set right in the heart of the ever popular village of Wrington with all facilities within walking distance. No. 9 is a ground floor apartment, with a grassy elevated outlook over the well maintained communal garden and to Wrington hill beyond. The accommodation is well presented with lots of built in storage, double glazing and electric heating; there are 2 beds, both with wardrobes, bathroom with shower, lounge with door to garden and fitted kitchen. Communal facilities include residents' lounge, guest suite, laundry and store room, plus the services of a manager part time during the week. All apartments have an entry phone for ease of access and there are well maintained communal gardens and parking. EPC rating C.
DIRECTIONS From the centre of the village and Wrington Motors continue up School Road and The Lodge can be found on your left before the village school. KITCHEN 7' 3" x 6' 1" (2.21m x 1.85m) Fitted with a range wood eye level and base units with rolled top work surfaces,stainless steel sink unit and drainer with mixer tap over, space for fridge, space for electric cooker, heater, vinyl flooring. BEDROOM ONE 14' 0" x 9' 0" (4.27m x 2.74m) Measurements include built in double wardrobe. Upvc double glazed window with rear aspect, night storage heater, wall light point. BEDROOM TWO 14' 0" x 7' 10" (4.27m x 2.39m) Upvc double glazed window to rear aspect, built in wardrobe, night storage heater, wall light point. 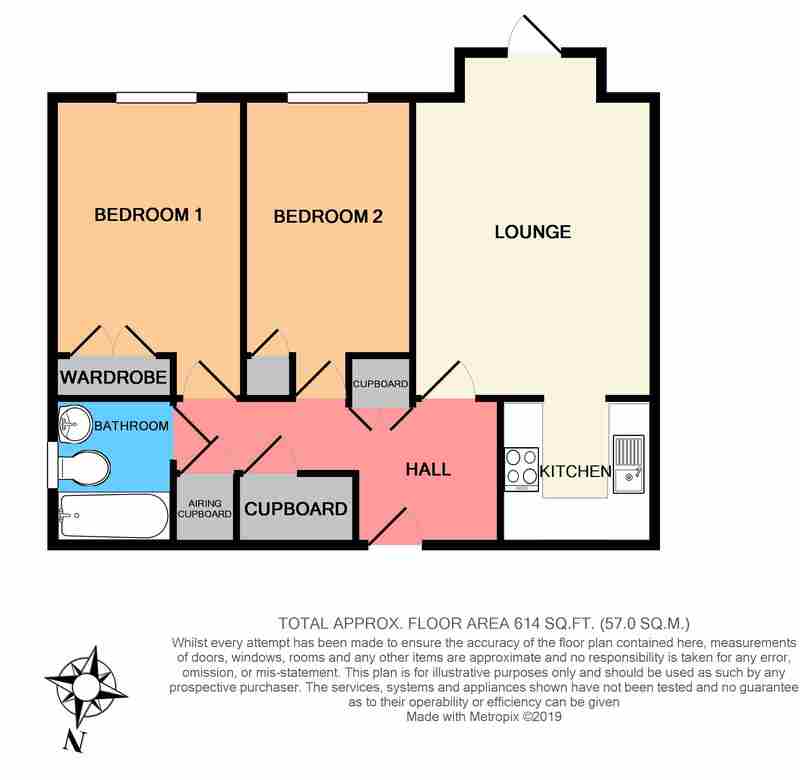 BATHROOM 6' 9" x 6' 0" (2.06m x 1.83m) Part coloured suite of low level WC, pedestal wash hand basin, panelled bath with electric shower over, hand rail, part tiled walls and tiled splashbacks, towel rail, extractor. OUTSIDE The Lodge is set in communal gardens which are well maintained and mature, and which surround the building. There are lawns, shrub and flower borders, attractive seating areas and ample tarmac communal parking. There are lots of places to sit and enjoy these lovely gardens. AGENTS NOTE Management charges for year ending 31st August 2019 are £3642.99 per annum, and ground rent £164.92 per annum.